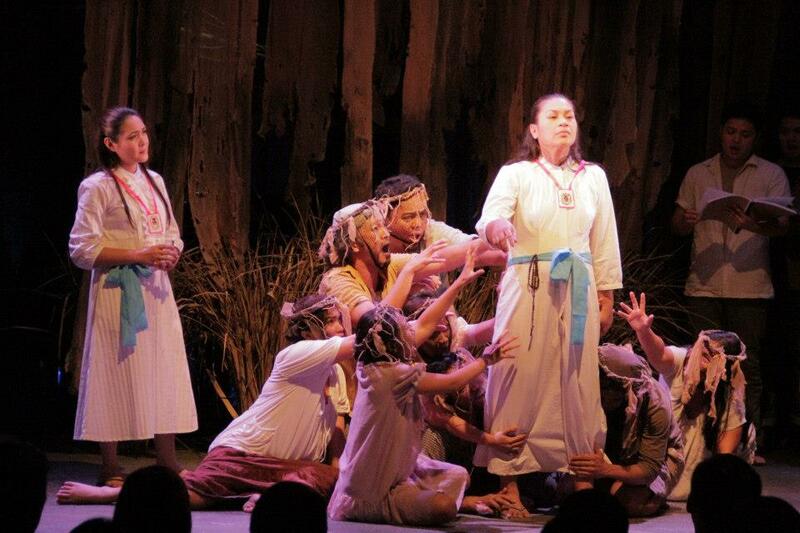 Ten years since it was first staged and earned commercial and critical acclaim, the Filipino musicale “Himala” goes onstage once again at the PETA Theater Center. Same as the film, "Himala" thematizes mass hysteria the rough the story of a young rural girl who achieves both divine and celebrity power as a faith healer. Describing the film's ambition in terms of the 'theatrical potential' of its setting, the 'histrionic stylizations' of its actors and the 'hysterical audience' before which the climactic scene was to be played. 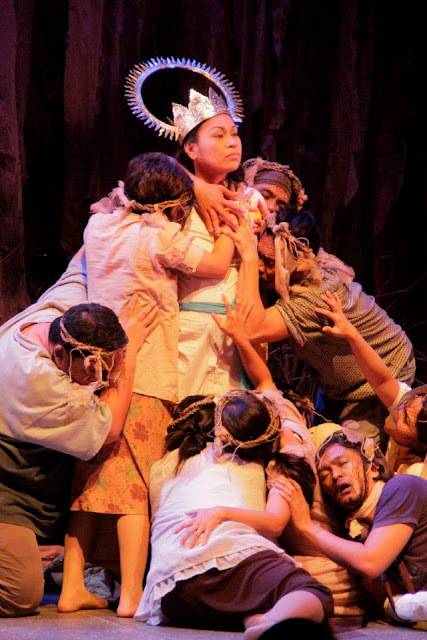 Elsa (played by May Bayot), the central character whose poor origins, humility and unearthly talent for healing capture the zealous devotion of an unruly multitude, barely educated country girl" revered and idolized by millions as much for her miraculous rise to spectacular power. Set in a far-flung barrio, a lowly, plain looking lass claims that the Virgin Mary appeared before her during an eclipse. She becomes a faith healer and almost overnight the sleepy town transforms into a bustling community. 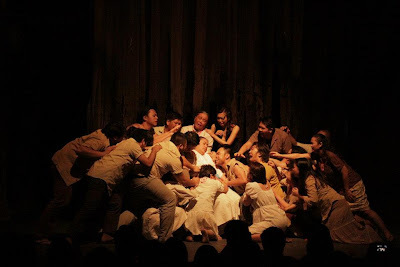 Pilgrims and tourists troop to Barrio Cupang out of curiosity while the sick flock to the once-cursed place with the hope that the miracle will heal them. Among the people who gravitate around Elsa are her two fanatic followers: a childhood friend named Chayong, almost saintly in countenance, and a poor woman who places her devotion to Elsa on top of her priority list. Two other important characters come within Elsa's orbit: a struggling documentary film director who treats his camera as his God and a downtrodden prostitute. The story blurs, as they say, the line between real and reel life. And that blurring, because it falls on the side of the 'real,' gratifies and exhilirates the critical sensibilities. This is one of the theater plays I've seen on stage that I would to love to see again and again. This stage musical is very faithful to its movie, though there are some changes because of the medium, but the message the film wants to convey stays. The central characters - May Bayot, Cynthia Guico, Isay Alvarez, and Dulce showed their powerful acting prowess on stage! I was moved my this play! I cried silently while seating on my seat. The experience of watching this play is pretty much an experience of a lifetime - as if I am also part of the mob. Anyways, the anniversary presentation is sponsored by the Philippine Theater Actors Guild as its first major venture. Librettist and composer De Jesus is chairman of TAG’s membership committee. The full cast of "Himala the Musical" includes May Bayot as Elsa and Cynthia Guico as Chayong, with Isay Alvarez playing Nymia. Other member of the cast are Dulce, Oj Mariano, Mia Reonal Bolaños, Myke Salomon, Melvin Lee, Lionel Guico, Angeli Bayani, Mayen Estanero, Neomi Gonzales, Joann Co, Bong Cabrera, Carlon Matobato, Red Nuestro and Onyl Torres. Also featured are Viva Voce and the UST Singers Alumni. Soxie Topacio directs. Tickets are at P2,000 for VIP seats, P1,000 for orchestra seats, and P650 for balcony seats. For reservations, call Ria Pangilinan 0917-5378313.